Fantastic news on the new dietary guidelines coming from the USDA today. A reprint of the press release below, with key portions highlighted, tells a great story. For a copy of the 91-page report visit the USDA's Center for Nutrition Policy and Promotion website. For more information, check out a piece I wrote back in 2007, "USDA Policy Contradictions: Apples and Kale vs. High Fructose Corn Syrup" , read what Marion Nestle of Food Politics (blog) has to say and today's coverage by Andrew Martin at The New York Times and NYTimes.com reader comments. Yes, we've come a long way baby. release of the 2010 Dietary Guidelines for Americans, the federal government's evidence-based nutritional guidance to promote health, reduce the risk of chronic diseases, and reduce the prevalence of overweight and obesity through improved nutrition and physical activity. long-term economic competitiveness and overall productivity. seniors, and dietary advice provided by health professionals. reduce risk for major chronic diseases. the Dietary Guidelines is included in the appendix. 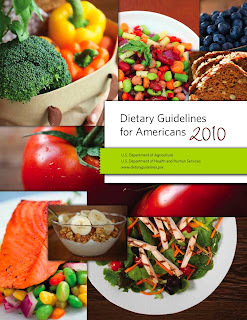 The 2010 Dietary Guidelines is available here. Thanks for sharing that announcement. New facts and guidelines about our nutrition can definitely help improve our lifestyle.